This tree can live over 650 yrs. 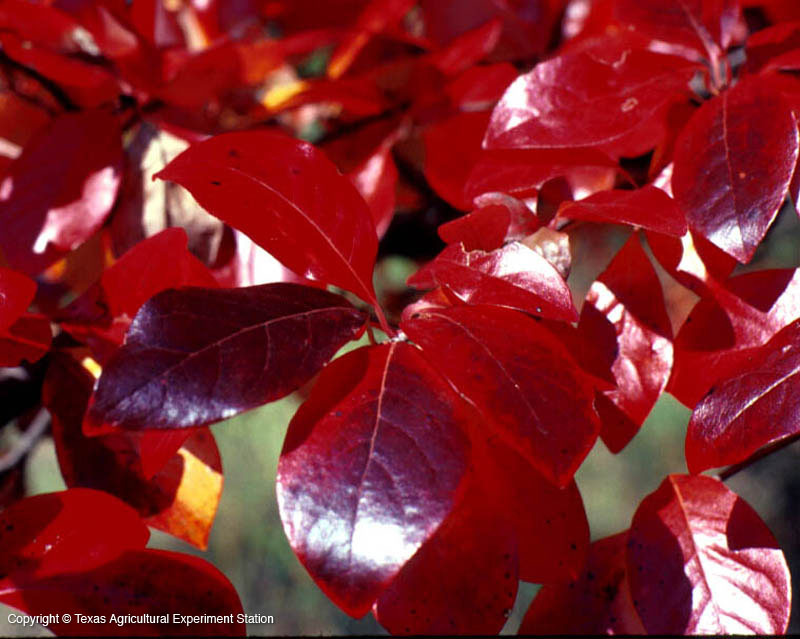 Valued for its vivid red & purple fall colors, it is used as an ornamental tree in parks. Small greenish-white flowers appear in May to June. Dark blue fall fruit is eaten by many birds. The split resistant wood is used to make mauls, pulleys, and bowls as well as for rough floors and pulpwood. Nyssa sylvatica, commonly known as black tupelo, tupelo, or black gum, is a medium-sized deciduous tree native to eastern North America from New England and southern Ontario south to central Florida and eastern Texas, as well as Mexico. The common name tupelo is of Native American origin, coming from the Creek words ito ‘tree’ and opilwa ‘swamp’. It grows to 66–82 ft tall, rarely to 115 ft, with a trunk diameter of 20–39 in, rarely up to 67 in. The bark is dark gray and flaky when young, but it becomes furrowed with age, resembling alligator hide on very old stems. The twigs of this tree are reddish-brown, usually hidden by a grayish skin. The pith is chambered with greenish partitions. The leaves are variable in size and shape. They can be oval or elliptical, and 2–5 in long. When full grown, they are thick, dark green with entire, often wavy margins; very shiny above, pale and often hairy beneath. The foliage turns purple in autumn, eventually becoming an intense bright scarlet or yellow and scarlet. Very small greenish-white flowers appear in clusters at the top of a long stalk in May to June when leaves are half grown. The fruit is a black-blue, ovoid stone fruit, about 1/3 in long with a thin, oily, bitter-to-sour tasting flesh. Its flowers are an important source of honey and its fruits are eagerly sought by many kinds of birds in the fall. The limbs of these trees often deteriorate early, and the decayed holes make excellent dens for squirrels, raccoons, Virginia Opossums, as well as nesting sites for honeybees. The wood of Nyssa sylvatica is heavy, hard, cross-grained, and difficult to split, esp. after drying. Its wood’s resistance to splitting led to its use for making mauls, pulleys, wheel hubs, agricultural rollers, bowls, and paving blocks. It is also used for pallets, rough floors, pulpwood, and firewood. 1. “Nyssa Sylvatica” Wikipedia. Wikimedia Foundation, 18 Sept. 2012. Web. 19 Sept. 2012. 2. Black Tupelo. (n.d) Digital Image. Tree Pictures. Web. 19 Sept. 2012. Retrieved from: www.tree-pictures.com/black_tupelo_tree_pictures.html.